Analytical Chemistry: A Practical Approach Evans E. Hywel, Foulkes Mike E.
Authors: Evans E. Hywel, Foulkes Mike E.
Add to cart the livre of Evans E. Hywel, Foulkes Mike E.
Analytical Chemistry: A Practical Approach takes a hands-on approach to analytical chemistry, directly reflecting how chemical analysis is carried out in a range of contexts. 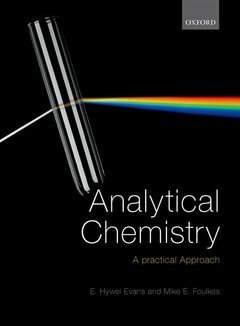 It provides students with a clear and easy-to-remember framework through which they can develop their understanding of the analytical process and and draws on a wide range of everyday examples to illustrate the practical application of analytical chemistry, including environmental analysis and food analysis. The authors present students with a range of worked examples, activities and problems to develop the skills of application and problem-solving they will need in the real world. E. Hywel Evans is an Associate Lecturer with the Open University, with 30 years' experience in teaching and research, including 25 years as a Reader in Analytical Chemistry at the University of Plymouth. He has published over 80 scientific papers and edited, contributed to, or co-authored several textbooks on analytical chemistry and spectroscopy. Mike E. Foulkes was formerly Senior Lecturer in Environmental and Analytical Chemistry at the University of Plymouth, with prior experience of working in industry as well as 30 years' experience as a researcher and lecturer in environmental analysis and analytical science.